This video clip is from the ABC series “Modern Family.” Those of you who watch the show will recognize Ed O’Neill as Jay Pritchett. On the show, Pritchett owns a company called Closet Fornia that makes and installs high-end closets. It’s funny partly because of the horrible name, and because we all know how important our closets are to us. There’s a lot going on in there! Now, if this is the kind of thing you find in a closet in someone’s home, imagine what you might find in an old basement or attic. Imagine what you’d find in one of those off-site storage places – designed primarily for hoarders who are “expanding their collections.” Yes, that’s an unfair over-generalization and a horrible judgment, but you get the point. No offense. I blame A&E. 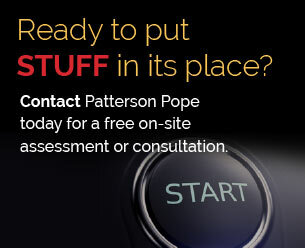 Patterson Pope has helped clients in a number of different industries store “stuff.” We’ve helped design and install systems to hold art collections, military equipment, library books, surgical instruments, sporting equipment, law enforcement evidence, and more. Our business is less about the stuff itself and more about helping clients house it – whatever “it” is. As you might imagine, over the years we’ve come across some fairly unique collections. It’s not often people let you peek in their closets. Now, though, we’re going to let you do just that – in a manner of speaking. We’re starting a new, semi-regular blog series called “Inside Storage: Stories of the Unique.” We’re going to share some stories of the more unique items our solutions help organize and house. Sure, it’s entertainment. It’s also education. Remember the saying, “It takes a village”? There are all sorts of people in the world – and all sorts of businesses. As you will see, they’re storing all sorts of stuff, too. You may have also seen the quote, “It’s not that it takes all kinds; it’s just that we’ve got all kinds.” Mmm. Very true. Keep a lookout for our first installment of “Stories of the Unique” coming soon!